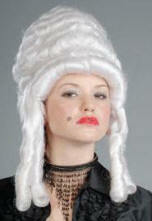 Exquisitely well made in a very fine fiber. With widow's peak and one curl on each side. 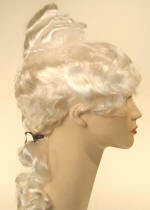 Mid 1700's men's powered wig with two curls on each side & a pigtail on the back. 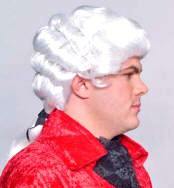 18th Century Revolutionary. Med Brown Red/Auburn (30) - for Thomas Jefferson. 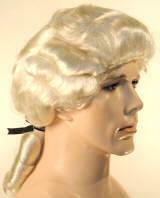 Mid 1700's men's powered wig with two curls on each side & a pigtail on the back. 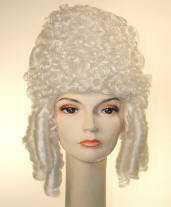 A more affordable version of above wig. History & dignity converge for low budget productions. 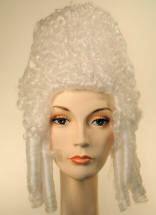 Most affordable version of above wig. 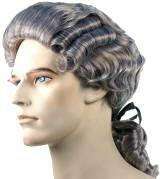 Mid 1700's men's wig with curls on the side. 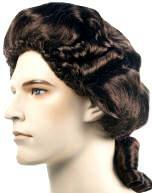 Mid 1700's men's wig with curls in the back.  Style will vary slightly from picture. 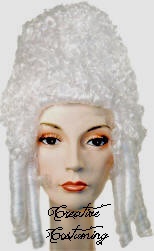 May not have side curl shown on black wig by ear. 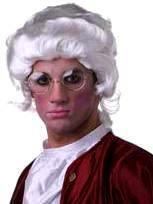 President Washington as we know him best. 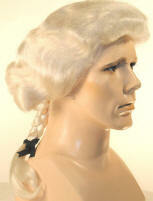 White colonial with pigtail and no side curls. 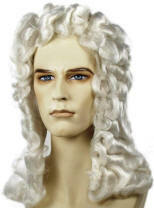 Popular 18th Century men's style. 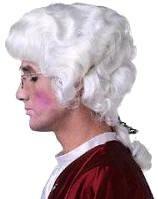 Unique Colonial man with very long tail. curls & a pigtail in back. 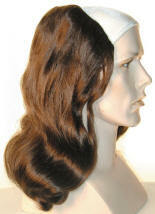 with a tail & wavy upswept top. 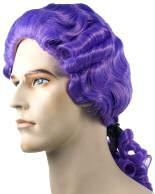 Also, in Violet for Amadeus Lady. Definitely stands out in a crowd! 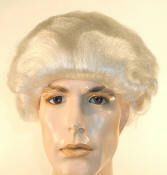 Wig may vary from picture. 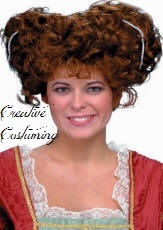 Good for Belle from The Beauty and the Beast. 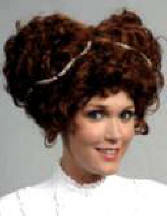 Looks just like the very first first lady! curls all the way around! 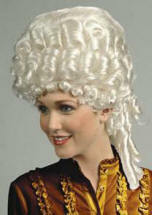 High Style of the French Colonial 17th Century. Clearly the life of any party! 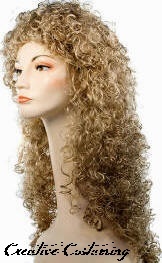 Extremely well made high wavy powered wig with large curls on the sides and in the back. 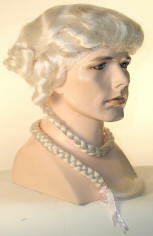 adorned smartly with strands of pearls. 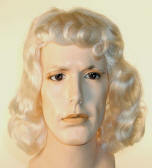 Manufacture calls it Platinum White but we feel it is more of a Bleached Blonde. 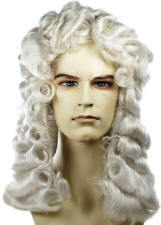 Fancier version of high powered wig with wavy hair. 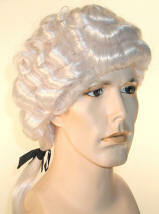 The whole wig is surrounded with beautiful stiff round curls. The queen returns! Beautiful head intact! A royal style to be relished. 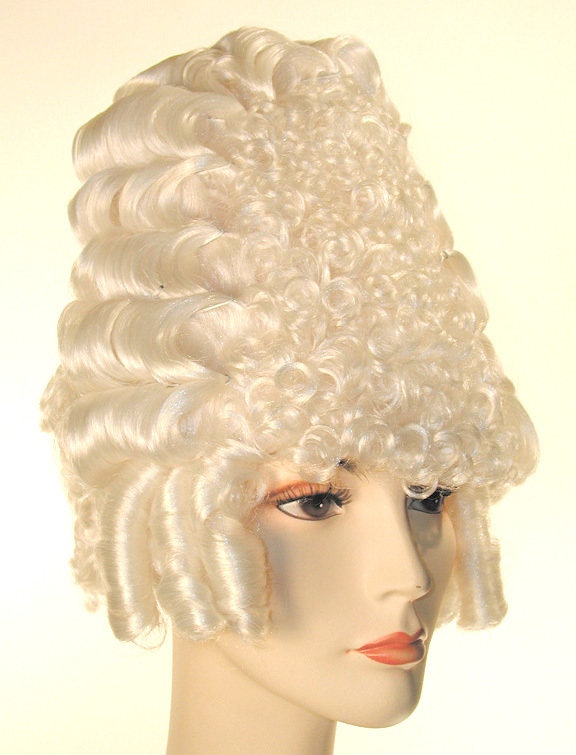 Cheaper version of the high 18th-Century styles. 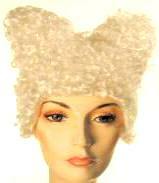 Made with 100% Kanekalon Fiber imported from Japan, the finest quality material available for synthetic hair. 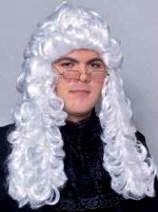 Whimsical version of 18th Century court style. 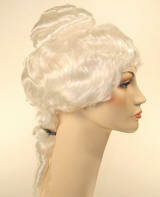 Good for Marie Antoinette or Fantasy Madame. 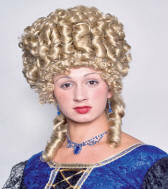 Tall wig with straight hair and large curls sewn at the bottom and sides. Twice the size of the regular version. BSame as Above but Back side in blue. 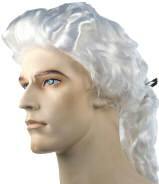 either side of the head. Not styled as nice as picture shows. 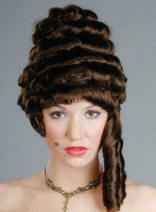 Oversized Beehive with v-cut bangs & side spiral curls. 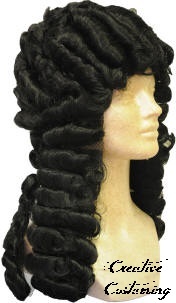 10" high with 12" curls. 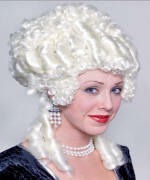 strands of pearls for a regal look. 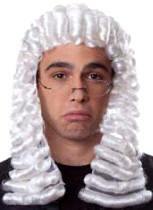 For English court scenes or as an alternative Colonial style. Short curly top & braids in the back. 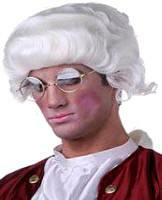 Also, for Colonial British Man. 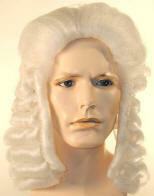 An extra fancy 3-sectioned judge wig. 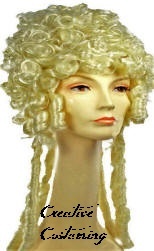 with each row of curls sewn on. 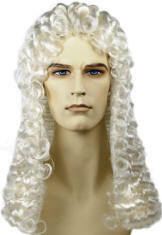 Best judge wig in this price range. each row of curls sewn on. 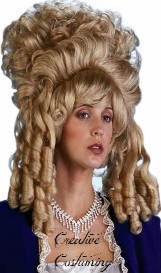 Not as fancy as the above wig. 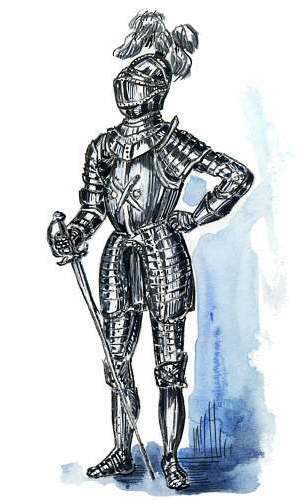 love this less costly but still respectable version. Good for Sir Isaac Newton. Or our friend on the oat box. Also, good for Dr. Johnson. 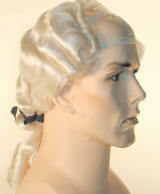 Bald cloth front with long hair in back. Good for Oliver Twist Fagin. with skin part. 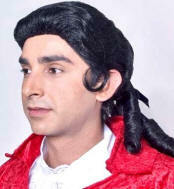 Good for 18th Century & Captain Hook. 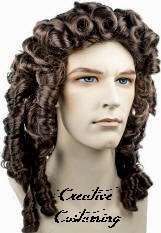 Exceptional looking skin part w/long fancy curls. 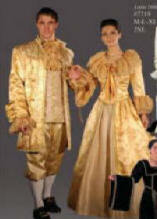 Very nicely made & good unisex historical style. Blonde (22), Auburn, Dk Grey (44), White. 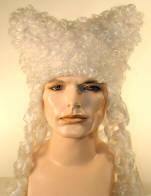 Beautiful skin part Alonge with less expensive fiber. 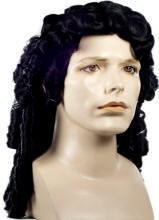 Exceptional skin part w/long historical curls. Exceptionally full and long with many smaller curls. 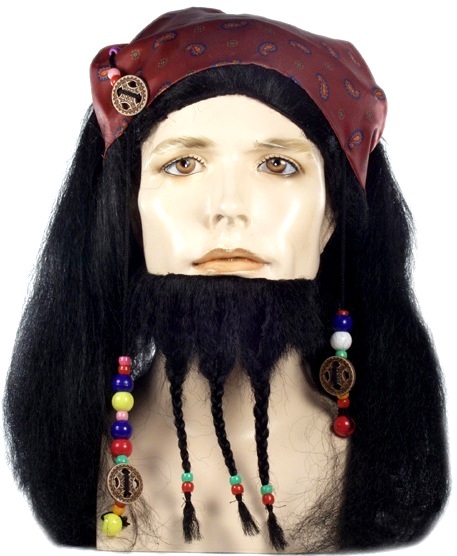 Plunder the Caribbean in this ornate wig & goatee, with braids, beads, trinkets & traditional bandanna. 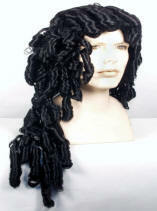 Buccaneer Pirate Wig with beads, red bandana & single braid on each side. Mustache and Beard available separately. 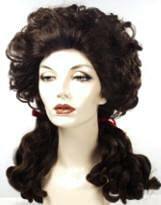 Well made longish loose curl wig. Also, good for Pirate. 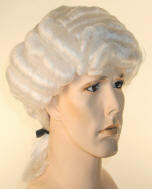 Longish wig in looser curls. 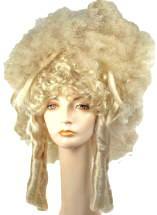 Designed to help manage hair under wigs. Blank Face (no facial features) w/Wide Base. With Face & Wide Base. 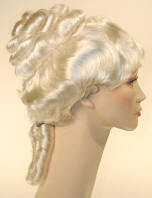 19" long gray wig with waves. 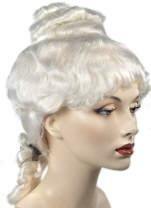 18" long gray wig with ribbon. show full potential. Personal results may vary. made by represtatives not meeting customer expectations. but is subject to opinion.